Use a workaround to install software not found in the Amazon App Store. 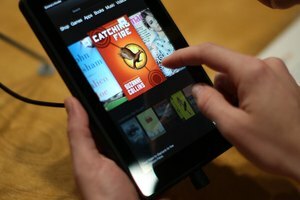 The Kindle Fire is an Android tablet bundled with a proprietary set of software, including the Amazon App Store, which offers a more limited selection of programs than the Google Play Store. While iFunny is available from the Amazon App Store, if you have trouble downloading it, you can work around this problem by installing an alternative software store. Many third-party application markets are available for the Kindle Fire, but as of January 2014, only 1Mobile Market offers iFunny. 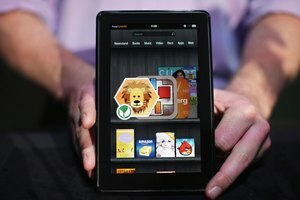 Since 1Mobile Market isn't available from the Amazon App Store, you must enable your Kindle Fire to install software from unknown sources. Swipe down from the top of the screen, tap “Settings” and choose “Applications.” Enable the “Apps From Unknown Sources” option and tap “OK” when prompted. To protect your Kindle Fire from malicious software, you can disable this option after installing iFunny. Open the Web browser on your tablet and visit the 1Mobile Market site to download the application (link in Resources). Since the download comes as an APK file, you need a file manager application to open it. Open the Amazon App Store and download a program such as Appsolutely File Manager, ES File Explorer or Aavid File Manager (links in Resources). Launch the file manager and navigate to the Downloads folder, then touch “1MobileMarket.apk” to install the application, which is added to your Apps library. Tap “Apps,” select “1Mobile Market” and search for iFunny. Installing the application through 1Mobile Market works the same way as installing software through the Amazon App Store. Select “iFunny” from the search results and tap “Install.” The program is added to your Apps library. Can I Work With Evernote in Offline Mode? Wayne, David. "How to Get iFunny on a Kindle Fire." Synonym, https://classroom.synonym.com/ifunny-kindle-fire-17043.html. Accessed 18 April 2019. 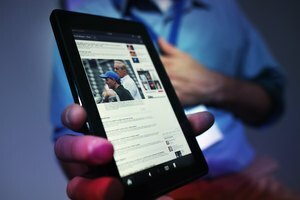 What Apps Work on the Velocity Cruz Tablet?